I’m flying to South Africa on Wednesday evening, arriving on Thursday evening (it’s a long way). On Sunday 29th May, at 5.30 a.m. I’ll be in Pietermaritzburg to sing ‘Shosholoza’ and toe the start line of the 91st Comrades Marathon with around 16,000 other runners. Eight weeks ago that seemed very unlikely. I’d almost about mentally conceded that injury and lack of training had defeated me and that I wouldn’t be fit enough to attempt Comrades. I think I’m fit enough to attempt it now, however I haven’t done anywhere near the number of miles that I hoped to run. Back in January in set myself a target to run 1,250 miles between January 1st and Comrades. I have actually run just 509 miles – only 40% of the target. I feel very under-trained. This lack of training helps in one regard – it expunges any thought of trying to run a sub 7 and a half hour time for a silver medal. I was much fitter and faster this time last year and I missed the silver medal by nearly an hour and a half. However, I ran a dumbass novicey race and I suffered a lot in the second half. If I learned two things last year it was the critical importance of walking and eating. I didn’t start walking early enough and when I did have to walk I had to do the horrendous Comrades death shuffle, interspersed with periods of glacially slow jogging. That cost a lot of time in the second half of the race. I also didn’t eat or drink enough, despite taking drinks at every aid station, save the first one. This year, I will follow a strict policy. The Comrades down run is 89.2km (its 2 km longer than the up course). That’s equivalent to 18 consecutive parkruns. After each 5km parkrun, I will reward myself with a 1 minute walk break. I will also take walk breaks on all steep uphill inclines (of which there are many). Comrades is essentially a fuel conservation race. This time, I will take some food with me – I’ve invested in some Race Ready ultra shorts from America that have multiple gel pockets and I may make use of a seconding service available at the Expo. This means I’ll be able to leave my own food and drinks at three special tables along the route. My mate and fellow Comrade from last year, Craig is travelling with me. Unfortunately Craig won’t be running this year, but it will be great to have some support with me. I’m sure I’ll also meet lots of friends from last year and hopefully meet some of the other UK runners, many of whom have been chatting on the Runners World forum over the past few months. It’s exciting. I really don’t know what time I am capable of. If I stick to my strategy and avoid a meltdown then I should be able to finish in under 9 and a half hours and if things go really well then there is a chance I could scrape another Bill Rowan medal (sub 9 hours). However, as long as I make it to the finish line at Kingsmead Stadium in Durban before that dreaded 12 hour gun is fired, I will be a very happy boy. Last Wednesday evening I did something that I haven’t done in over 6 months – I pinned a number to my white Valley Striders vest and participated in a road race. I had a go at the final race of the three John Carr 5K races held on quiet flattish estate roads in Esholt. The race went better than I expected – I ran a time of 18:11 to finish 51st from 391 starters and 5th in my 45-49 age category. I was certainly race rusty. After a comfortable opening kilometre, I found myself slowing on the slightly uphill second km and my mind wandered. 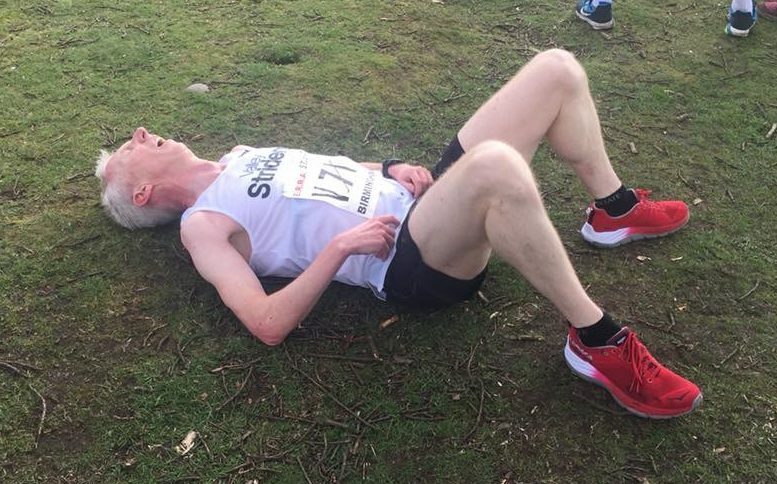 Instead of concentrating on the race – being in the moment and embracing the pain – I had thoughts like “my God, what am I doing, this feels horrible” and “my achilles hurts, I’d better slow down”. In other words, my central governor was having a night off. I got to the half way turning point in a very disappointing 9:30. As we turned, I gave myself a bit of a talking to and I increased my speed and passed a few competitors on the homeward (slightly downhill) leg. With around 500 metres to go the inflatable finishing arch was in sight and I kicked for home. This spurred a few others to engage me in racing to the line, which helped the finishing time. I loved the racing bit at the end, but I was pretty spent at the line and had to take a few minutes to regain some composure. It was great to be racing again. Thanks for all the kind words of support and encouragement. If you want to track me or anybody else at Comrades, there is an app called Ultimate Live. My race number is the same as last year – 24598. Welcome back, hope to spot you along the route. We finished together last year, remember? I will be doing my 10th comrades and can’t wait to claim my green number. Of course I remember! Have a great run and make sure you secure that Green number, would be great to bump into you on Sunday.